OMG EVERYONE! 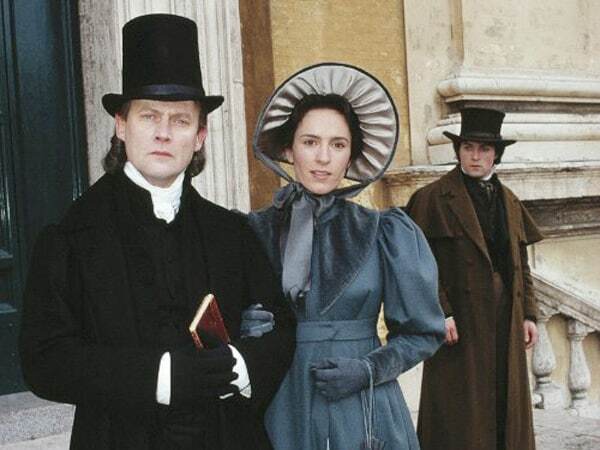 One of my very favorite BBC historical costume serials of one of my very favorite Victorian novels is on Amazon Prime! 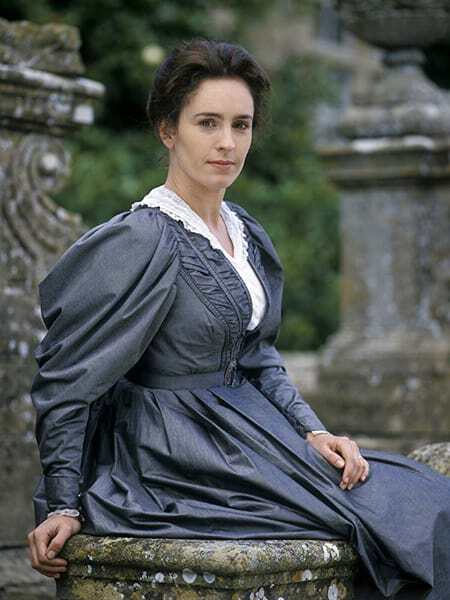 It’s 1994’s Middlemarch based on the George Eliot novel! I recently sat down and indulged in a rewatch, and it was just as enjoyable as I remembered. The serious Rev. Casaubon & earnest Dorothea — Ladislaw looks on. 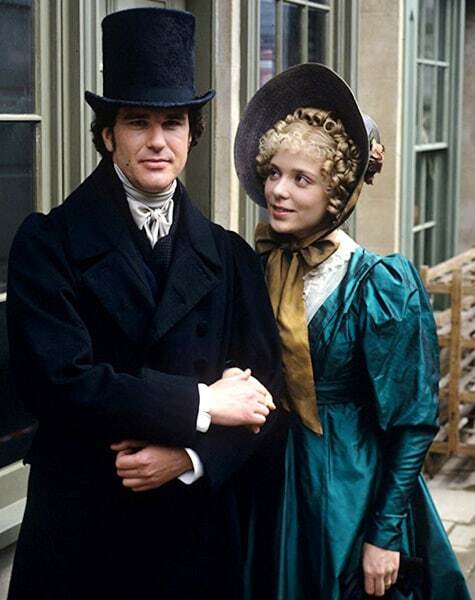 Set in a small English town specifically between 1829 to 1832, the original book is subtitled “a study of provincial life.” There are two main romantic plots and several minor storylines entwined around them. 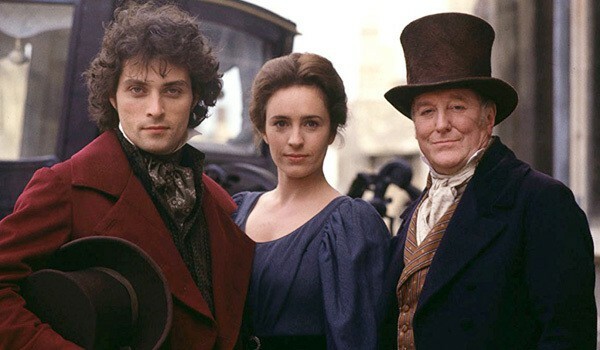 The first major story is about the idealistic Dorothea Brooke (Juliet Aubrey) who first marries a much older scholarly type, Reverend Casaubon (Patrick Malahide), and then she eventually falls in love with his young cousin Will Ladislaw (Rufus Sewell). 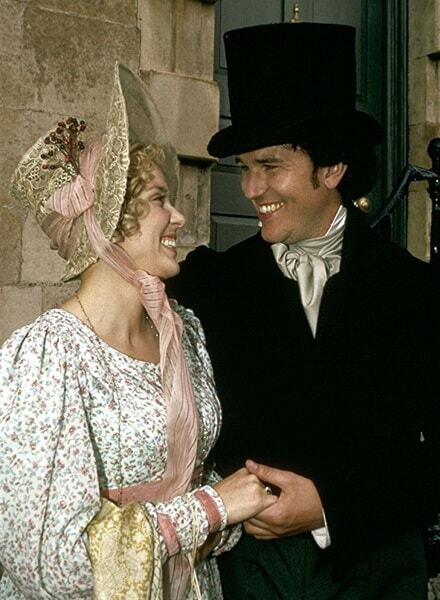 The second key story is around Dr. Tertius Lydgate (Douglas Hodge) who comes to Middlemarch with plans of research and reform but marries social-climbing Rosamond Vincy (Trevyn McDowell). Dr. Lydgate is ensnared by pretty, vapid Rosamond. Costume designer Anushia Nieradzik had done plenty of historical TV series before Middlemarch and went on to design costumes for films such as Belle (2013), A United Kingdom (2016), and Journey’s End (2017). 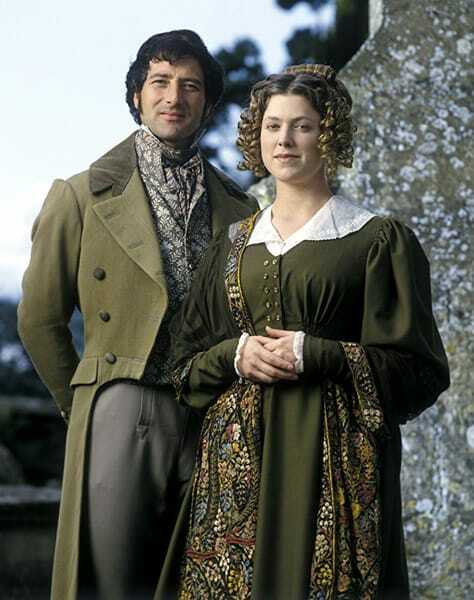 For this TV miniseries, the costumes are not always flashy but very slice-of-life, showing everyone from raggedy poor farmers to the posh landed gentry and the folks in between. Reportedly, this was the most expensive series the BBC had made up to that point, equivalent to how much Merchant-Ivory spent making Howards End (1992). Both the costumes and production design reflect money and time spent, as well as a strong commitment to historical accuracy. Rosamond’s brother Fred is a spendthrift, but he’s in love with the far more sensible Mary. She and her father help make Fred into a solid citizen. Note the fine but not-too-showy wedding ensemble. Compare to Lydgate & Rosamond’s more fashionable wedding, with her lower neckline, fancy lace, elaborate hair, and trailing flowers. Rosamond has a new gown and bonnet in most every scene. And for dinner parties, she does the elaborate hairstyles that were just becoming trendy in the early 1930s. Then there’s Dorothea’s sister, Celia, born into the landed gentry and fond of pretty things, but not a grasping, vain middle-class girl like Rosamond. Celia marries Sir James Chettam. Ladislaw is idealistic, much like Dorothea, except he is poor. Modest, and simple, Dorothea eschews fashion for a life of the mind. But still looks totally up to date. Have you seen Middlemarch? Will you be watching (or rewatching) it on Amazon now? I loved Middlemarsh and plan on rewatching it soon. Rufus is so swoon-worthy in it. The costumes by Ms Nieradzik are spot on and absolutely gorgeous whether it’s one of Dorothy’s subtle bluestocking dresses to Rosamond’s dernier cri bespoke look to Mary’s practical garb. This and Wives and Daughters are my favourite Frock series for the time period. Even the Reverend Mr Casaubon wears proper shoe attire indoors. 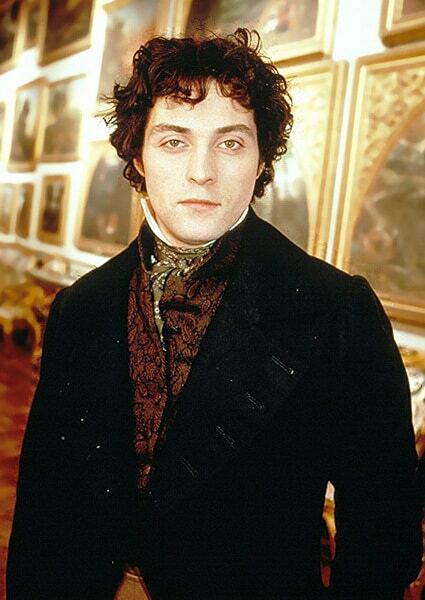 This was totally Rufus Sewell’s breakout role, & it’s delightful to watch him in it again! Everyone is excellent tho, & it’s fabulous for a rewatch. The day after the first episode was shown in Britain I had to attend a conference in London. A young man offered me his seat on the tube saying he was getting off at the next stop. It was Rufus Sewell. 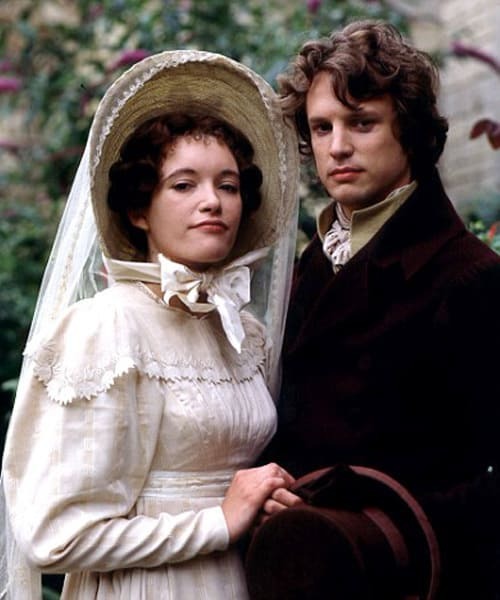 Love both the book and movie of Middlemarch! So glad to see it’s a favorite here. What do you think of Dorothea’s hair? it always looked a bit too plain to me – would it have been accurate for the era? Also want to say how much I enjoy reading Frock Flicks every day! I’ve learned (and laughed) a lot. Thank you! 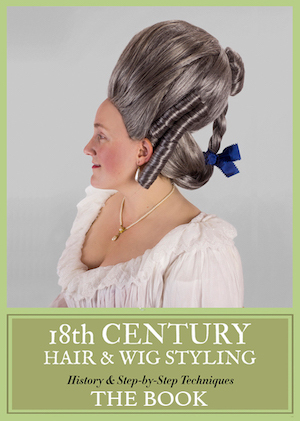 Dorothea’s hair is accurate, but mostly it’s appropriate for the character — she’s so obstinately plain & modest. Compare to her sister, who wears curls & jewelry & richer colors. There’s even a scene after Casaubon dies when Dorothea is wearing a cap (aka ‘widow’s weeds’) & her sister complains & rips it off. 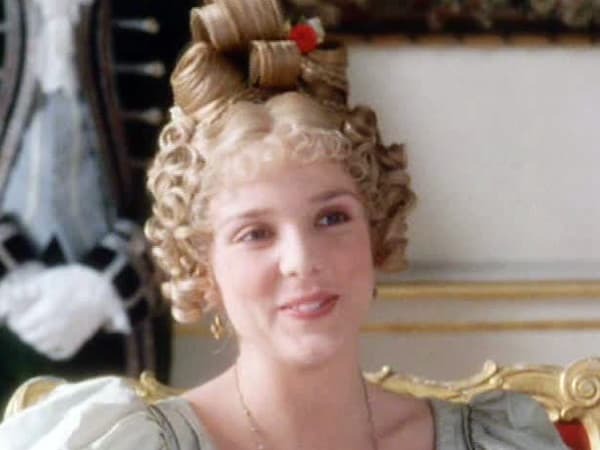 Dorothea’s hair falls down & is beautiful (I think it should have still been pinned up, but y’know, TV effect). So yeah, it’s all to make a distinction about the character. Oh yes, the hateful cap! haha Thank you! I started watching this and then left off and it disappeared off whatever streaming platform I’d been on.. It was doing a good job of making me interested in the book, too! Luckily I still have that—I really need to read it. It was a gift from a dear friend who told me it’s his favorite, and yet it’s been years that I’ve had it (meanwhile others have told me it’s great). I’ll have to move it to my bookshelf, and see if I can find the show again. The book is lovely and deserves its status as a classic, but you have to read it slowly and patiently, enjoying the scenery along the way, the way it’s written. It was sort of a zen experience for me. I must admit I found the series a bit boring. It’s a respectful old-school adaptation but it doesn’t have whatever magic the novel possesses that makes you not mind the lack of drama. Bonus: it’s a really good adaptation of the novel! But you know it’s going to be good when Andrew Davies writes the script. I loved this when it first came, and it certainly put Rufus Sewell on the charts for me. Then I re-watched it last uear, a bit worried I would be disappointed as one so often is when a couple of decades more of fashion history tells you what looks weird. but i still loved it!